When it’s time for Air Conditioner Installation call us! Bill’s Heating and Air Conditioning not only maintains and repairs your HVAC equipment, but we install new equipment as well. Of course, you don’t want to invest in a new Air conditioner if you don’t need one and we would never advise you to do so unless it was a cost benefit to you. What does that mean? 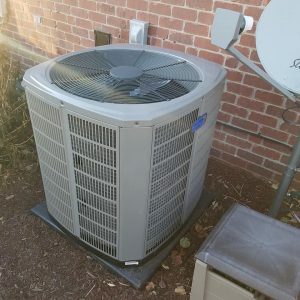 It means that if, when maintaining or repairing your air conditioner, we find that the cost to repair it is more than the cost of replacing it, we will let you know. We will give you all the information you need to have to make a good decision for you and your home. • Listen. We listen, and when given, we take satisfaction survey feedback from American Standard to heart. Installing a new Air Conditioner means you have our full support and the support of American Standard’s as well. We will replace your aging or inoperable Air Conditioner with the only brand we sell, American Standard. Be confident with the knowledge that you are getting one of the best brands of HVAC in the U.S. Bill’s purposefully chooses to be aligned with companies and products that our customers can trust. You can rely on Bill’s to install your new air conditioner and have it efficiently operating in no time. We’ll also make sure that any brand discounts or specials will be applied, if available. Trust Bill’s for your new Air Conditioner installation and to service and maintain it after the installation. That’s what we do. We take care of you and your HVAC equipment. Being around for as long as we have, we think we’re pretty good at it.